The most active volcano in the Hawaiian Islands exploded and started shooting out ash plumes on Thursday. The video shows the Kilauea Volcano. Since April 30 there have been hundreds of earthquakes shaking the eastern side of the Big Island of Hawaii. A 5.0 earthquake is believed to have triggered the eruption. ​Residents have been ordered to remain on "high alert" this week after the collapse of the Puu Oo Crater in Kilauea Volcano, according to local media reports. "It's a good time to get supplies if you need to replenish your supplies and just stay in tune with what' going on with civil defense," Hawaii County Civil Defense Administrator Talmadge Magno said May 2. ​Portions of the national park where the volcano is located have been closed in recent days in anticipation of an eruption. ​But the volcano itself is notoriously active. Kilauea's name translates roughly to "spewing" or "much spreading." 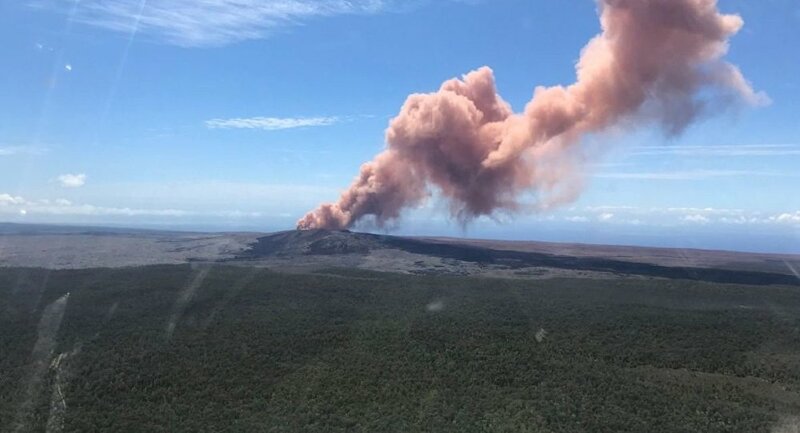 "A short-lived plume of ash produced by this event lofted skyward and is continuing to dissipate as it drifts southwest from Pu'u 'Ō'ō," the Hawaiian Volcano Observatory (HVO) said Thursday. "Anyone downwind may experience a dusting of ash. At this time, the 10:30 earthquake has caused no other changes at Kīlauea Volcano," HVO added.